Mariana Yolanda Ochoa Reyes (born February 19, 1979 in Mexico City) is a Mexican singer and actress. OV7, formerly known as La Onda Vaselina, is a Latin pop group from Mexico formed in 1989, but it was not until the early 1990s that OV7 would begin to make their mark. With a career spanning more than 25 years and several hits in the Latin American charts, OV7 remains as one of the most successful pop bands in Latin pop history. Ochoa's first major role was in the soap opera La Hija del Jardinero (2003–2004), a TV Azteca production. The soap opera was well received in Latin America. La Hija Del Jardinero is a Mexican telenovela directed by Luis Alberto Lamata. It aired from August 18, 2003 until April 23, 2004 on TV Azteca in Mexico. Recently Mariana did another major role in Amor Sin Condiciones, a remake of the successful soap opera Secreto de Amor which was produced in 2001 by Venevisión and Fonovideo in Miami. Besides working her second album, Mariana is recording a new series for TV Azteca called Se Busca un Hombre. It began on February 12, 2007 at 8:30pm on Azteca 13. EMI Group Limited was a British Transnational conglomerate founded in March 1931 in London. At the time of its break-up in 2012, it was the fourth largest business group and record label conglomerate in the music industry, and was one of the big four record companies ; its labels included EMI Records, Parlophone, Virgin Records, and Capitol Records, which are now owned by other companies. Lucía Leticia Méndez Pérez is a Mexican born telenovela and film actress, top model and singer. Gianella Neyra Magagna, is a Peruvian actress and model. Irán Castillo is a Mexican actress and singer. Kabah is a Mexican group based in Mexico City. It was formed in 1992 and disbanded in 2005. In 2015, they reunited and went on tour with OV7 titled "Ov7 Kabah Tour." They were named after the Maya archeological site. En éxtasis is the fourth studio album by Mexican singer Thalía. The album was released in 1995 and soon became a huge success in Latin America and other countries. This is the first album Thalía recorded on the company EMI Music. This is also her first international release. Sasha Sökol (born Sasha Marianne Sökol-Cuillery on 17 June 1970 in Mexico City, Mexico) is a Mexican singer, composer, actress and TV host. Daniela Romo is a Mexican singer, actress and TV hostess. The discography of Mexican recording artist Thalía, consists of twelve studio albums, five compilation albums, two live albums and seventy singles. Her first album as a solo artist, Thalía, was released in 1990 by Fonovisa Records. With the same label she released two more albums; Mundo De Cristal in 1991 and Love in 1992, which had generally positive commercial success in Mexico and some countries in Latin America. Myriam Montemayor Cruz, better known as Myriam, is a Mexican recording artist, known for winning the first season of Mexican talent show La Academia. Sergio Basañez Rodríguez is a Mexican actor. Luna Llena is the second album by Mexican singer-songwriter Mariana Ochoa, released by Warner Music in Mexico on September 21, 2007. Edith Márquez Landa is a Mexican singer and actress. She is a dramatic mezzo-soprano. She was born in Puebla City. 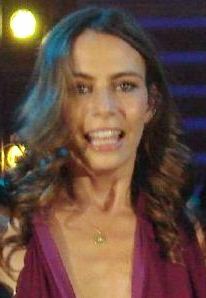 Mariana Garza Alardín, is a Mexican singer and actress. Alix Bauer Tapuach is a Mexican singer of Ashkenazi Jewish origin. Los Tucanes de Tijuana is a Mexican norteño band founded on April 13, 1987, by Mario Quintero Lara and a group of friends in the City of Tijuana, Baja California, Mexico. The members began their musical career by playing in nightclubs. Roberto Blandon is a television actor in Mexico who starred in soap operas in that country in 1989, including the role of Henry in the soap opera "Mi segunda madre" producer Juan Osorio. He was among the first actors to join the broadcaster TV Azteca, then returned to Televisa. It has also been featured in theater performances and recently found in the soap opera recordings Camaleones. Ari Borovoy is a founding member of the Latin music children's groups La Onda Vaselina and LemonGrass, which evolved into the successful Latin pop group OV7. As a songwriter, he had a hand in creating several of the group's biggest hits, including "Aum Aum," "Shake Shake," "Te Necessito" and "No Me Voy." He has also recorded solo albums, starred on telenovelas and in films. The 6th annual Billboard Latin Music Awards which honor the most popular albums, songs, and performers in Latin music took place in Miami.